The Harry Potter series contains a lot of different kinds of stories. There’s the coming-of-age stuff where a boy is thrust into a world he doesn’t fully understand, traditional good-versus-evil bits, and even a little high school drama for color. One thing it didn’t have, though, was a story about blue-collar men and women in New Jersey sweating it out on the streets of a runaway American dream and riding through the mansions of glory in suicide machines—but apparently the movies almost did. 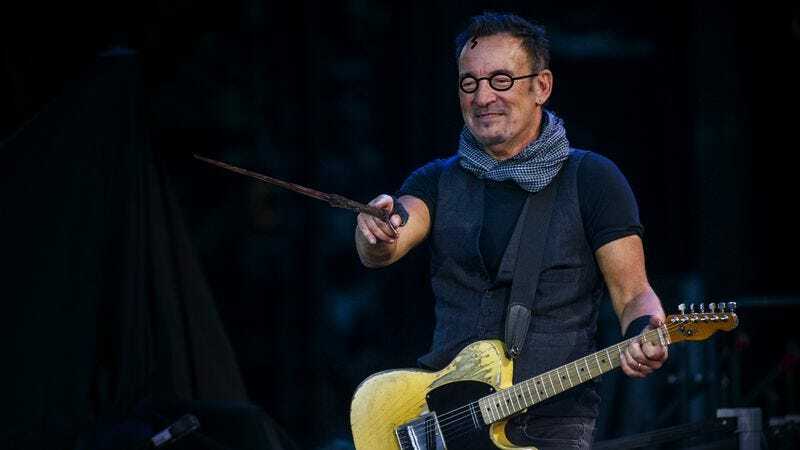 As reported by Entertainment Weekly, Bruce Springsteen recently confirmed to BBC Radio 2 that he wrote a song for a Harry Potter film that never got used. The song was titled “I’ll Stand By You Always,” and Springsteen says it was “a big ballad that was very uncharacteristic” of something he’d normally sing himself. He says it was “pretty good” and hopes to “get it into a children’s movie of some sort,” but that’s pretty much all he’d say about the song. The Boss doesn’t know why it didn’t get used, but if we had to guess, we’d say it’s because the idea of Bruce Springsteen writing a song for Harry Potter is just straight-up bananas. We could be wrong, though.